In my last blog, I discussed my introduction to Facebook. Since then, I have discovered new facets of Facebook that I want to share! I was using Facebook mostly to connect with friends and family. Remember, I am a Social Media Dinosaur, so connecting with organizations or businesses was not on my radar before my journey to become a Social Media Diva. First, I of course “liked” the Johnson & Johnson Facebook page. Next, I ventured out and connected with other businesses and organizations. This has only enhanced my experiences with these groups. Take the J&J Facebook page for example: We use Facebook (and many other social media platforms) to keep our employees, agents and partners informed on topics such as new products, office closings, community involvement, employee anniversaries, and many other current happenings around our offices. Make sure you or your agency have “liked” our J&J Facebook page. It’s a great way to put a face-to-name of our Underwriters and other employees. If your agency has a Facebook page, please let me know – I want to connect with you! 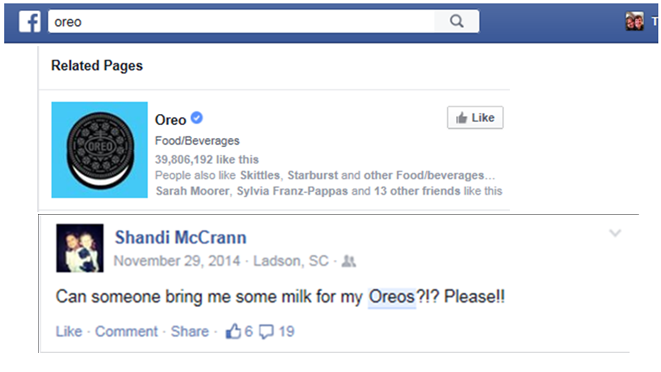 Not only did the product page appear, but so did a comment made by my Facebook and J&J friend, Shandi! In my journey to become a Social Media Diva, I have discovered some really exciting things – mostly good, but also a few bad things. We all know the risk of being on social media and losing our privacy. So before joining any new network, do a little research and learn how to change settings to limit who can see what you’re posting. And remember: IT’S SOCIAL MEDIA and on the internet. So don’t be fooled into thinking all posts or likes are totally private. My journey from Social Media Dinosaur to Social Media Diva is getting interesting. NEXT: My experience in joining LinkedIn. This entry was posted on April 16, 2015, 1:09 pm and is filed under Uncategorized. You can follow any responses to this entry through RSS 2.0. Both comments and pings are currently closed.